Sign design often involves integrating/extending a client’s brand and identity. Consistency of information and design is also at the heart of reliable wayfinding systems. But what about after installation? How do we ensure our clients appreciate the need for brand conformity and overall consistency for new and updated signs? We are very proud to provide a platform for SDS members and guests to expand on this topic with our three special guest speakers: Mark Ovenden, Tim Dunn and Ann Gavaghan. Last December, Tim Dunn tweeted photos of London Underground signs in the wrong typeface. His post prompted a twitter discussion that touched on a range of issues including branding, heritage and sign maintenance. 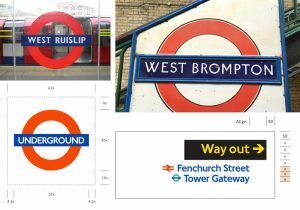 In this three-part talk our speakers will cover the history of Underground signs and their branding, examples of off-brand Underground signs, and how London Underground is addressing this issue. Historian, author and broadcaster Mark Ovenden will give us an overview of the Underground’s graphics standards manuals and their corporate typeface Johnston. He’ll expand on possible reasons for off-brand signs (including Johnston’s fall from grace when it wasn’t flexible enough for modern uses). Writer, broadcaster and public transport buff Tim Dunn will showcase a plethora of off-brand Underground signs to illustrate the scale and kinds of problems that can be found on the Underground. He’ll present the point of view of travellers and typophiles alike. London Underground’s Ann Gavaghan will discuss Underground signs from the perspective of operational (station and train) staff who step into the breach when signs fail to help customers. We’ll also get a sneak peek of the Underground’s station presentation handbook, and find out how staff and designers responsible for station standards can meet the challenge of avoiding poor or off-brand Underground signs. Ann Gavaghan is the Design and Communities Development Manager for London Underground. She spends her time obsessing about the 270 stations that make up the London Underground network. Ann spearheads a programme to connect stations with their local communities through heritage, greening, music and literature projects. She has a background in urban planning and graphic design, and is passionate about explaining why design matters. Tim Dunn is a writer, broadcaster, historian and erstwhile museum curator. He delights in bringing the most niche diversions of British transport history to light. Tim has been referred to as ‘the naughty curator’ and – after he presented BBC TV’s Trainspotting Live – as being ‘at the junction of fogey and hipster’. He is totally fine with this. As a marketing manager, typophile and enthusiastic public transport user, Tim spends far too long hunting down bad transport signage and getting over-excited about kerning errors. He will not rest until someone commissions his quite clearly brilliant ‘WrongFontSpotting Live’ TV idea. Mark Ovenden is a transport design historian, internationally respected author, presenter, broadcaster and lecturer. His ten books have been translated into many languages, with sales approaching 200,000. The New York Times called his books ‘pure catnip’. Mark’s recent one-hour documentary for BBC4 – ‘Two Types: The Faces of Britain’ – was watched by 400,000 people. The Daily Telegraph and The Guardian both chose his documentary as their picks of the day – with The Guardian calling it ‘fascinating’. He brings joyful insight and accessibility to what might appear to be dry, geeky, or technical subjects. His infectious enthusiasm – in print, on TV, radio or delivering talks – enthrals audiences. Please book your free or paid ticket online. We have limited tickets available, so please book early to avoid disappointment. Wine, soft drinks and snacks included in all tickets. Already a member? See details above for booking details.